Nanny to Mommy received complimentary products to provide this post. All opinions are our own. 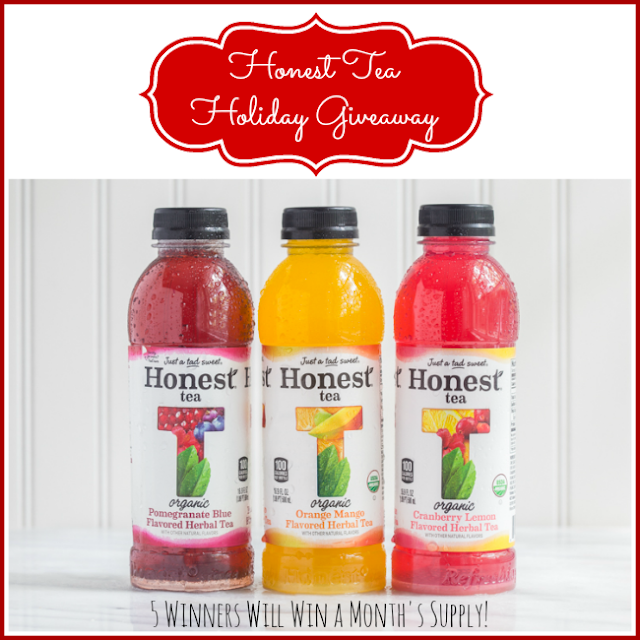 Welcome to the Honest Tea Holiday Giveaway! Honest Tea seeks to create and promote great-tasting, healthier, organic beverages. They strive to grow their business with the same honesty and integrity they use to craft their products, with sustainability and great taste for all. Their tea is hand plucked through fair trade practices from organic, real-brewed, compost tea leaves. 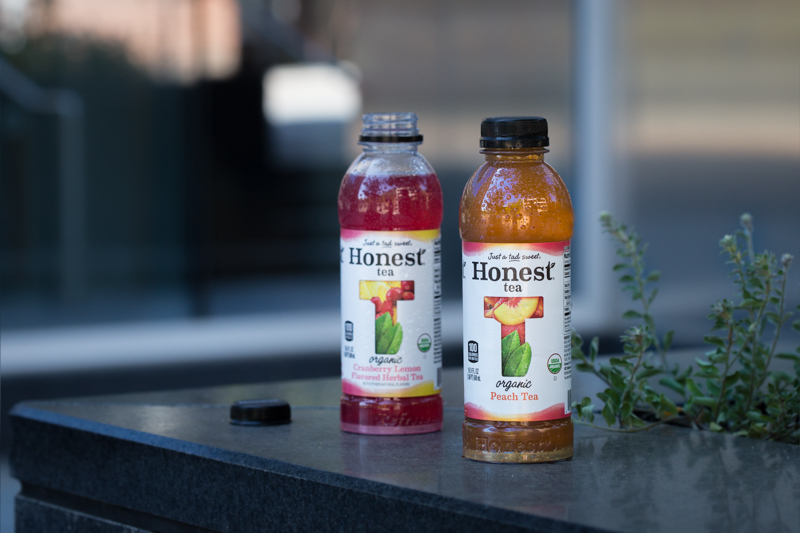 Making for a great tasting, truly honest tea. 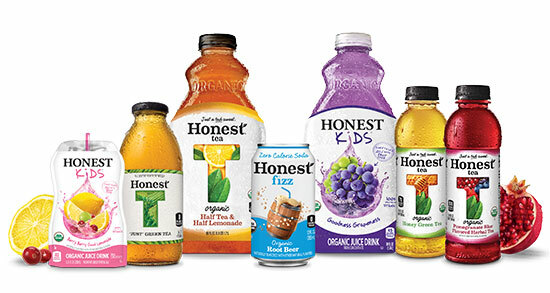 Honest specializes in offering beverages that range from unsweetened and zero grams of sugar to ones that are "just a tad sweet." Their teas, juice drinks and sodas use a variety of natural sweeteners, including Organic Sugar Cane, Fair Trade Organic Cane Sugar, Organic Honey, Organic Fruit Juice, Stevia, Organic Maple Syrup, and Organic Agave Syrup. They have a range of products to choose from as well as vast variety of flavors. My children loved the Honest Kids they received and their favorite flavor was the fruit punch which has grape, strawberry, and watermelon juices. Check out the full review. FIVE winners will receive a MONTH's supply of Hones Tea! Entry is simple, just follow the prompts on the Rafflecopter below. Open to US only, must be 18+ to enter. Winners are chosen via Random.org through Rafflecopter, all winning entries are verified. Make sure to follow us on Facebook to keep up with our current giveaways. Good luck! Nanny to Mommy and participating bloggers are not responsible for sponsors who do not fulfill their prize obligations. Facebook, Twitter, Pinterest and any other social media are not affiliated with this giveaway. Nanny to Mommy received complimentary products to provide this post. No monetary compensation was received to share this giveaway. One entry per household/IP address. No social media was involved in this giveaway in any way. Winner is chosen via Random.org through Rafflecopter. ALL winning entries ARE verified. Winner will have 48 hours to respond with all information in email or another winner will be chosen. If you would like to see your product featured in our Holiday Gift Guide or sponsor a giveaway event, please contact us. The flavor I would most like to try is their Organic Super Fruit Punch from their Honest Kids product line. It has watermelon, strawberry, and grapes juices in it. It only contains forty calories per pouch, as well. I would love to try the orange mango flavor it sounds so good my family would love these teas too. I want to try the cranberry lemon flavor. I'd like the Raspberry Tea! Sounds yummy! I want to try the cranberry lemon tea. I would love to try the Peach Tea! I would like the try the Cranberry Lemon! Im most excited to try cranberry lemon!! It sounds delicious!! I have never tried any so I want to try as many as I can! I'd love to try the half tea, half lemonade! I LOVE Honest Tea! Their peach tea is my favorite, but I'm happy to try any flavor! I have never tried any of them, but the mango flavored one sounds very good, and I would totally try that! I am most excited to try the Orange Mango Herbal Tea, I am a big fan of all things orange! I love Honest Tea - That Cranberry Lemon sounds awesome! I would like to try the Haft tea and Half Lemonade! Orange mango herbal tea first. Need that Vitamin C.
I enjoy cranberry lemon or most types. Love to try. Big fan of herbal teas. Half tea half lemonade is what I want to try. My favorite is Raspberry Honest Tea! LOVE Honest Tea, and the rootbeer sound so yummy. I will have to try it next. I would love to try the honey green tea. Raspberry Honest Tea is yummy! I would love to try Raspberry tea! excited for tropical tango punch! I would love to try the cranberry lemon tea - it sounds very good. My favorite is the Peach Oolong, but I'm reading JellyPA's comment and see there is a Cranberry Lemon which also sounds delicious. I'd love to try the orange mango flavor. I love the Half Tea Half Lemonade! Peach tea sounds lovely in the middle of winter! Taste of summer in a bottle, I tell ya. I'd love to try the Cranberry Lemon Flavored Herbal Tea! My son loves the peach tea. I like orange mango. I want to try cranberry lemon herbal tea! Yummy! I would like to try the Pomegranate. I would love to try cranberry lemon! I would love to try the honey green tea. I feel it would give me a really refreshing start to my day. I'm interested in the Root Beer as well. Sheila M. The first flavor I want to try is Orange Mango Herbal Tea. Orange mango..yum then the cran with lemon. I'd love to try Orange Mango! I want to try the peach tea, it sounds delicious! I would like to try the Pom Blue. Love the Half and Half iced tea....one of my fav Honest Tea flavors! I love their peach tea. I like the raspberry, the lemon, but root beer? tea? that sounds really interesting! I love Honest unsweetened tea - just the original stuff! I do love the Pomegranate Blue ... but also the Honey Green. There aren't many flavors available at my local grocer so I'm game to try any of the flavors! I buy a bottle of Moroccan Mint almost every day. It has such a great soothing taste. very zen. I love it over crushed ice and a few extra fresh mint leaves. hope I win. I think the Peach Tea sounds like a flavor my family would like. I would like to try the Kid's products for my grandchildren. I am IN LOVE with their Peach White Tea. I would most like to try the Honest Fizz root beer, I've never tried their carbonated products. I already love the honey green tea. I would like to try the pomegranate blue. I would like to try the Peach-oo-la-long, Mango White and the Black Forest Berry Herbal Teas. My favorite is the Mango White Tea. The Cranberry Lemon sounds good, I've never seen that one in our local stores. I am interested in trying Honest Fizz! My kids have been drinking Honest juice boxes for years. We love them! I would most love to try Honest Tea's Orange Mango flavored herbal tea! Whatever is lowest in sugar gets my vote! I love half tea, half lemonade! I'm also interested in trying peach tea! Love peach and that there's no sodium! Sodium is bad for people with pulmonary arterial hypertension and other heart disease. My husband swears by Honest Tea! He tried the mango flavored tea but wasn't fond of it. I think he's not crazy about fruit teas. We'll see what he'll try next. I do drink Honest tea. My favorite is the peach. I have tried the pomagranite but didn't care for the flavor. I think I'll try Acai next. I'd like to try the cranberry lemon one - haven't seen that one here yet. I would love to try the ginger ale. I didn't know about the Honest Fizz line till now. I will definitely be keeping my eyes open now. the Heavenly Lemon Tulsi Herbal Tea also sounds really good. All the flavors sound delicious but I really want to try the Cranberry Lemon tea! I would really like to try the cranberry lemon herbal tea. I'd like to try their Honey Green Tea. Would love to try the raspberry tea!!! I love all the flavors but cranberry lemon is great. I love grape; so I would love to try the grape flavored drink! A Tad Sweet Orange Mango! I am most excited to try the Orange Mango. I would love to try the Black Forest Berry Herbal Tea. I would love to try the peach tea. Peach is one of my favorite flavors. Thank you. All the flavors sound good, but I'm most interested in trying the Orange Mango Herbal Tea. It sounds like one I would like to drink in the morning. I have tried the Cinnamon Tea and it is really good! I have tried the cinnamon before and it is really good! I'm totally addicted to peach tea and would love to try the Honest Tea version of my favorite flavor. I am most interested in trying the cranberry lemonade. I thing it would be super yummy fresh from the fridge! I'm most excited to try their Radiant Raspberry flavor. Delicious!! The orange mango flavor sounds great, and I also love cranberry flavor! I would most want to try the cranberry lemon, it sounds sweet and start and so refreshing! I am most interested in trying the Cranberry Lemon. I've never tried anything with those two flavors together and it sounds interesting! I'm a coffee drinker, but the whole family loves tea. I love the Peach Honest Tea!! My kids would love the juice pouches. I'd be interested in the Peach Tea flavor. I like Crystal Lite peach tea packets, so I'm assuming it would be similar. I would love the Half Tea and half lemon from Honest Tea, would be cool and refreshing and remind me of my grandmom who used to make tea with a lot of lemon in it. I would like to try the Peach or raspberry Honest Tea. I think the cranberry lemon would taste good to me.